After a snowy Sunday, more snow arrived in the Chicago area Monday afternoon and evening. CHICAGO (WLS) -- After a snowy Sunday, more snow arrived in the Chicago area Monday afternoon and evening. The snow began to fall shortly after 3 p.m. and continued through the evening rush and into the night. It is expected to end, moving west to east, between 10 p.m. and midnight. A Winter Weather Advisory went into effect at noon and is set to expire at midnight for counties in Illinois. For northwest Indiana, the advisory is in effect from 3 p.m. until midnight. In the suburbs and northwest Indiana, nearly-blinding snow started falling at the worst possible time for commuters. Near northwest suburban Lake in the Hills in McHenry County, two small cars couldn't handle the snow and slush, spinning out dangerously in traffic. But it wasn't just tough for small cars; a semi skidded out on 80-94 near the Indiana border, snarling already bad rush hour traffic. Plows started early, but it wasn't enough. "Roads are a mess, bad traffic, lots of accidents, people going too fast," said Tony Arguijo, plow operator for Burr Oak Group. The freezing temperatures, barely hovering at double digits, caused more problems, freezing fluids in a plow connection. "The way the snow keeps coming down, it could take me a lot longer than usual just to get home," said driver Jeff Ornstein. In the city of Chicago, neighborhoods were covered in a white, frosty layer of dry snow that sent residents indoors. "Stay in the house. Keep warm, man. Just buckle up in front of the TV," said Brandon Gentry, who lives in Hyde Park. No such luxury for tow truck driver Rudy Medrano, who said the cold is the bigger problem. "A lot of jump starts. Some flat tires. That's the other thing: when it gets this cold, your tires get real low," Medrano said. The Chicago Department of Streets and Sanitation deployed 287 snow plows and salt trucks to respond to the rush hour snowfall. "Once the snow stops and we clean up the center lanes and the curb lanes, then we'll move to the neighborhood streets," said Cole Stallard, deputy commissioner of the Department of Streets and Sanitation. As of 9:32 p.m., 557 flights were cancelled at O'Hare Airport, with an additional 41 flights cancelled at Midway and both airports reporting delays averaging less than 15 minutes. Monday evening's snowfall created treacherous conditions for the evening commute. The Illinois Department of Transportation and Indiana Department of Transportation said they deployed their fleets of plow and salt trucks to the highways as well. "Our trucks are going to be in the same traffic as everybody else. It's supposed to be very intense storms, so it's not going to last a long time but it's going to come down at a very quick rate," said IDOT spokesperson Gianna Urgo. IDOT deployed more than 300 trucks. "It's going to be a storm where we really need the public's patience here," Urgo said. State and city agencies say they have enough salt to get them through this next storm, but there are other areas of the Midwest that will need extra help. Leon Benish of Chicago Salt Company has already gotten requests for salt in areas harder hit, like Indiana and Michigan. With snowfall from this weekend as well as inches of snow to come, he says he's been busy. "Eventually we will probably run out of salt here, if we keep getting these little hits like we're getting where basically salt days are not snow days. We're using up a lot of salt," Benish said. There was a salt shortage four years ago, that caused the price to soar more than double. That could happen again this year. In addition to the snow, bitter cold temperatures moved into the Chicago area Monday morning, with wind chills well below zero. A water main break on Pulaski Road between 32nd and 33rd Streets has caused significant problems and forced both northbound and southbound traffic to share a lane. Crews were eventually able to clear the scene for motorists. On Sunday, the Chicago area saw around 1-2 inches of snow, and slippery conditions resulted in dozens of crashes in northwest Indiana. 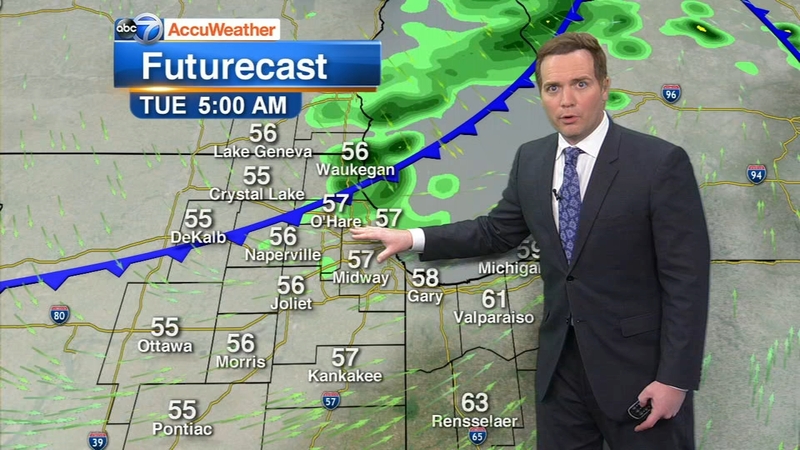 Because of the snow, ABC7 Morning News will be going on the air early at 4 a.m. Tuesday.